Posted by claireblang in Coffee with Claire B., Drivers. It’s 7:00 a.m. EST. You know that I would not forget you this morning. I am literally running out the door and sending this via Blackberry as I am headed to Dale Earnhardt Inc, for Dale Earnhardt Day. I’m going to broadcast “Dialed In” from DEI today 4-7 EST from DEI. Today’s event at DEI Honors the birthday of 7 time NASCAR Champion Dale Earnhardt… “Behind the legend – he was one of us”. You know it was a spectacular Dega race to talk about on air with you all yesterday. It may be like reality radio today but I just have to be there and to take you with me. I have packed every cord and wire and have enough equipment with me to rig the space shuttle! Get some rest at work today and I’ll catch you at 4:00 EST – it’s going to be wild. It doesn’t matter who you follow – Dale was one of a kind and we should stop – even if we’re busy – and remember him and the stories that surround Dale and his legacy. I hope we never forget the drivers who have paved the way for the young guys racing today. I remember the song he liked played for him on local radio in Charlotte, when I was had a local morning radio show there – “I’m in a hurry to get things done – rush and rush until life’s no fun…” It’s an awesome song and I’ll open the show with it today. Catch you then. I gotta get in gear and fly. Posted by claireblang in 2008 Season, Drivers, Teams. How much is Tony Stewart worth and what will you give up for him? Where does Joey Logano fit into your plans? Does this contract have to do with money for Tony (Stewart)? Posted by claireblang in Breaking News, Drivers, In The Garage, Transcripts. Question: When did you get contacted and how do you feel about filling in for Dario today? Stremme: “Obviously, right after the race yesterday people had started talking with Jeff Dickerson who represents me and there’s a lot of chain of events that had to go on. Obviously, I called Rusty and had to ask him and then we called Roger (Penske) and asked him which Chip (Ganassi) had already spoke to him in Kansas. So all that was approved and then it was just a matter of getting my seat insert down here and putting it in the car. But you know this is something we don’t like to see anybody get hurt and I didn’t know how bad Dario was. During the race I knew they were working on him down there but there were so many big wrecks yesterday. But it was just a misfortune. I went and seen Dario last night. His ankle was all wrapped up and stuff and you know we’ll just sit in for him today and try to help him out. Question: Steve (Hmiel), what’s the deal looking ahead and how is Dario doing and that sort of thing how long will he be out? Hmiel: I don’t know. He’s actually out here in his motor home and I’m sure he’ll end up going to Indianapolis this week to see Dr. Trammell and his group. Probably the best in the business at patching stuff like that up. They can perform miracles it seems like but you’d think an ankle injury like that would be at least two to three weeks even more. David have they talked to you about filling in for other races? Stremme: It’s just this weekend. That’s all we got. Stremme: It’s not really necessarily today that I have something to prove. I mean I proved that signing with Roger Penske and the opportunity they’re going to give me there. It’s something that I feel very strong on the situation I have there and looking forward and what I have with that organization. Nothing with Chip and them I left on good terms and that’s why I’m helping them out today. Stremme: Yea obviously – we could win today you never know – here. You know like yesterday we had a really good run and I like speedway racing. We finished seventh here in the spring last year with this same team. So, ahm…but there’s a lot of obstacles that we gotta overcome. They had to qualify the car in- there’s a couple of things that they got to do there. But at the end of the day you know anybody can win this race and I feel like plate racing – I have a lot of fun at it and that’s what we are going to do today is get them the best finish we can for Dario, Chip and Tums. Hmiel: We don’t know. We’re very grateful that we have David for this weekend and after that it’s a matter of getting through today, seeing where Dario ends up and then sitting down as a group and deciding who’se the best option for where we’re going. Certainly we’d like to have one stand out guy like David Stremme do it all. He’s not available so we may end up picking and choosing a little bit based on the fact that we have to qualify this car into the race because we are not in the top 35 and we have to look at all our options in terms of getting the car into the race and then how good we’ll do in the race to stay in the top 35. So we may end up with multiple drivers. We may end up with one single driver. All that’s the kind of stuff that we’ll talk about on a Monday morning at the shop certainly with Chip and with everyone else involved. Note: When asked about whether his contract would allow him more – Stremme repeated “This is a one race deal.” Steve Hmiel noted that they had asked for Stremme to possibly be available for more but it’s clear that that is not an option at this point and that this indeed is a one-off race for Stremme to help another driver out and to assist Chip Ganassi in a pinch. Good morning from Talladega – Welcome to race morning. On Friday, Dario Franchitti was telling reporters how much progress he felt he had made since entering stock car racing. Today, he’s in his motor coach elevating and icing his leg with a fractured ankle suffered in a multi car accident here at Talladega in the Nationwide Series race yesterday. David Stremme will fill in for him. I walked into the garage earlier today and saw the Ganassi guys with Stremme getting him fit and adjusted to the car he will race today. Several permission slips were needed – from Rusty Wallace who Stremme races for in the Nationwide Series and from Roger Penske who uses him as a test driver. I asked the Ganassi folks how long Franchitti will be out with the fracture – they said it’s hard to tell. Franchitti will visit his own doctor I am told next week and they’ll go from there. Franchitti did not take an airplane home and is here in Talladega – impressive. He may venture into the garage yet I am told but elevating the leg is key right now. Stremme will meet with the media at 9:30 this morning so I’ll be leaving soon to go over and see what he has to say. I’ll fill you in when I get back. I have to make this quick as I’ll be leaving soon. Light rain early this morning here at Talladega. As I left the hotel the desk clerk was sitting outside smoking a cig. “You need the room another night in case it rains?” she asked. “I’m trying to get a total.” So goes the story of the morning. I’ll be back with you. Oh, and I’ve had a lot of email about my interview Friday with Shane Hmiel – in case you missed it I transcribed a portion of it and am posting it below. I’ll be back with more of it and replay it next week. Former NASCAR driver Shane Hmiel failed a third drug test in 2006 and was banned by the sanctioning body. Since then – he has taken steps to revive his career and turn his life around and he is being considered to be approved by the sanctioning body of ARCA. He found out he was bi-polar and he’s been through intensive treatment. “I’m feeling good, I mean I’ve been out in California racing USAC Sprint cars and Midgets and we raced three times and won all the races and sat on a pole and led a bunch of laps but you know I mean I’m feeling good. I’m feeling better than I was this time last year. Everybody knows what all I went through and that was all brought upon by you know it was all my fault but I’m in a better place now. You know I went through a treatment center last July and found out a lot about myself and found out I was bi polar and you know I always knew something was kind of messed up with me. You know I knew I wasn’t a complete idiot. I have made some stupid decisions racing and off the track so you know it just feels good being back acting normal and being at the race track. CBL: How much do you feel different on the inside and how much do you feel that you have grown up? How old are you now? CBL: You don’t want to celebrate this and say oh wow it’s great he’s better and all that but you do want to check back and say this is a horrible situation for all involved and your family has put a lot into helping you get back to where you are now . You have people who want to be race car drivers. Young people who are listening right now. What would you say to them? CBL:I hear that you may be allowed to run the ARCA Series. I don’t want to jinx that for you – but should that come to be what would you think about that? CBL: What are your plans. I mean -you know there are some people who would say don’t let him ever race and there are others who would say he’s only twenty some years of age. The bi-polar thing may and doctors saying that is what you had may help in the sense that there was something else wrong with you. I don’t know what these series consider…what should they consider? MORE OF THIS INTERVIEW WILL BE POSTED AND IT WILL BE REPLAYED NEXT WEEK ON XMSN CHANNEL 144 – on “Dialed In” with Claire B Lang. Posted by claireblang in 2008 Season, Coffee with Claire B., Drivers, Trackside. Good morning from Talladega Superspeedway! Who is the favorite here at Talladega Superspeedway? I can hear the shout out from the campground here even as folks look up from frying eggs and bacon recovering from a night of Dega mania and “Hell Hill” yelling – “Junioooooor,” Jeff Gordon can’t be overlooked and, well, Tony Stewart has been in such a great mood! The favorite here? I’d have to say Dale Earnhardt, Sr. Somehow when I drive in the tunnel here I can never forget the time that big E looked me in the eyes and I had probably the most engaging discussion that I ever had with him in all the interviews that I did. It was after his stellar performance here at Talladega in the fall of 2000. I had seen him race so many times here but this was perfection. He came through the pack from 18th to first place like a bat out of hell in the last five laps and it was brilliance. Later, there was a media event at DEI and I asked him to explain how he did it – and I told him my breath was taken away watching him navigate this racetrack. He looked me directly in the eyes and for what seemed like 20 minutes described how he did it. With Dale Senior you usually had to walk while you talked – or he had the glasses on so to actually get that much time and to have him describe his racing Talladega – I knew at the moment that it was a rare moment that I would not take lightly. I never did. Today, here at Talladega I thought you’d like to read what Jeff Gordon said yesterday here in the garage about Dale Sr., about his career, and about his chances here. Below, is something to sip on with your coffee. WHAT WAS IT LIKE RACING AGAINST HIM? WHAT ABOUT THE ENGINE ISSUES YOU HAD EARLY AT DAYTONA? HOW MANY MORE YEARS, HOW MANY MORE WINS AND CHAMPIONSHIPS DO YOU HAVE LEFT IN YOU? JG: “You always love getting asked that question. Makes you feel old. I don’t feel pressure. I feel I’m in a great place in my life and my career. No matter what this season offers me I have a lot to be excited and proud of and happy about. I’m a competitor, I like to be competitive and I think what’s helped me contribute to team’s I’ve driven for throughout my career and be successful. I hope it always continues until the day that I can walk away from it. Hopefully I can walk away from it on my own terms. I don’t know, I couldn’t tell you. WHAT’S THE BEST DIRT TRACK? WHEN YOU GET GEARED UP TO COME BACK TO TALLADEGA, YOUR NOT SUCH A BAD GUY? THEY AREN’T THROWING STUFF AS HARD NOW, MAYBE? DO YOU THINK YOU SHOULD BE THE FAVORITE HERE BASED ON LAST YEAR? -Did anyone hear Carl Edwards say last week on camera that the race in Mexico was “the most fun he’s had with his clothes on”? I know I heard him correctly. -I had Shane Hmiel on the air yesterday – He was banned from NASCAR due to not passing the sanctioning body’s substance abuse policy. Since then he’s been in treatment and found out that he is bi polar. He said he used drugs to try to manage the bi-polar situation. Word is that ARCA may soon approve him to race in their series. He says he’s never been so poor or felt so good now that he’s straight. I’ll keep you posted on the ARCA deal and I wish him well. Posted by claireblang in Drivers, Teams. Hey all: I just got back from the garage after talking with Greg Zipadelli (Tony Stewart’s Crew Chief) here at Talladega Superspeedway. While he says “nothing is forever” he also said it’s way too early to be talking about where Tony Stewart and he individually or together might end up after contract talks end. Zippy said its way too early to speculate what is going to happen. More on “Dialed In” at 4:00 EST today. Posted by claireblang in Breaking News, Drivers, Teams. Can you talk about the reports about your contract? Are you happy at Joe Gibbs Racing and do you want to leave? Would you like to get out of your contract early? Do you think you will be at Joe Gibbs Racing in 2009? Would you like to get back to Chevrolet? Is Home Depot part of your future? When would you hope for a decision to be made? Would you be willing to run 15th every week to be a part of building something? Have you talked to Bob Nardelli (former CEO of Home Depot) at all? Is there too much emphasis put on the Haas CNC story? What type of owner role do you want to have? Are you going to talk to Joe Gibbs Racing about partial ownership for you to remain with their organization? What was the reaction you got at Joe Gibbs Racing when you presented some of these scenarios? Was it after Phoenix that you spoke to Joe (Gibbs) about these other options? Who is the ‘we’ that you keep referring to? How much do you want to keep racing in NASCAR? How important is this contract based on your age and older drivers statistically don’t have the same results? Would these long-term deals be beyond your driving career? Are you a candidate for Richard Childress Racings’ fourth car? What were you and Kevin Harvick standing out there laughing about? When you were dirt track racing in Indiana, did you ever envision yourself in a spot like you are now? Why do you want to own a Sprint Cup team? Are you disappointed with J.D. Gibbs coming out and saying that you have a contract through 2009 and you are going to be driving for Joe Gibbs Racing through 2009 with all of these other options and opportunities out there? Have Joe (Gibbs) or J.D. (Gibbs) come back and offered you part ownership and said that they want you to be more a part of our family? What about Hendrick Motorsports with Haas’ relationship there? They can certainly provide the same package as Joe Gibbs Racing. What is really important to you and what kind of team do you want to race for? So you didn’t say that you wanted out, but you did speak through some scenarios of maybe making that happen? How many offers have you had — five or 10? Are you worried if you don’t do it now, that the business model will continue to change with people owning race teams that were not drivers in the past? How much did the Dale Earnhardt Jr. offer last year and the Kyle Busch offer intrigue all of these other people to come to you? Would companies like Gillette-type or Fenway-type organizations that have massive across the board sports appeal be of interest to you? How daunting of a task is it to know you have all of this to go through in the next year? How much does sponsorship have to do with it? How has your friendship with Kevin Harvick and what he has done for that organization impacted your thoughts about ownership? What type of owner would you be — A.J. Foyt or Joe Gibbs? Posted by claireblang in Coffee with Claire B.. This is the first in a daily morning blog – a quick post over coffee to stay in touch with you on claireblang.com. The posts and hits to this site are increasing – and I’m hoping this site is a way for me to post things that you may have missed on the show or items over the weekend after “Dialed In” goes off air. Note: Major breaking stories I will file on XMSN Sports Updates (every 20 minutes) over the weekend. Most days are crazy busy – so I’m going to attempt to jot you a quick note every morning about what’s going on – with the hope that even if you can’t be on the road following the NASCAR circuit like I do – you’ll feel like you are along for the ride. I picked up my Starbucks today and headed to the race track shortly after 7:00 a.m. I’m in the radio room here in the media center – and there are a handful of radio talk shows live down the hall from me. These rooms are not soundproof. I can hear all the radio hosts talking loudly (as if all trying to outdo each other with opinions) – and the buzz is, of course, Tony Stewart. Sounds like “Conspiracy Theory Thursday” from what I can hear – with everyone throwing theories around now that Tony has said that he’s negotiating and has not decided where he will end up. I thought that I’d miss Stewart’s conversation about his contract yesterday in the Nationwide garage as I was live on air in the mobile unit in an area in front of the track when it was initially scheduled. The hauler chat with Stewart was delayed as he was still in the Nationwide practice. When I got off air in the Chevy mobile unit I slammed my computer and audio equipment in a back pack and drove as fast as I could get by with through the tunnel and to the media center then ran into the garage. When I got there Stewart was still debriefing with his team and the media corps in attendance was waiting for him in front of the hauler. What did I notice? Well first of all I had said the day before as the Tony Stewart “inside source” stories outlined what they had learned that I felt Stewart was negotiating plain and simple. When you negotiate you check out what’s out there and you most certainly would want it to get out that you are in demand. It struck me as Stewart held court that he took every single question and bent over backwards to be accommodating to every single media person in the group. I like Stewart and he’s always been good to me when I need an answer on something–but trust me Stewart does not hold court with the media for almost a half hour – after practice – in that mood- unless it’s something that he wants to get out and communicate. Do you not think that if Stewart or his people did not want the story out about his being offered deals that could have him at some point asking for an early release that it would have gotten out? This, as I said earlier in the week is what negotiating is. I’m not always right – and I try not to be too opinionated so that listeners feel more comfortable with their opinions – I don’t want to tell race fans how to think. I want to hear what they think and give them all the information I can gather that would spur the discussion in an accurate and unbiased manner. This time – I was right. Stewart was and is negotiating. And that is what he announced on Friday. I was glad I was there. Stay tuned today – I talked with Kevin Harvick after I left the garage with Tony Stewart. I’ll share with you what he said. Also – After driving five hours – anchoring a live three hour show – filing reports to XM Sports Nation and XM Channels across the board and audio back to XM – it was time for dinner and a Merlot. I was fried. At 9:30 p.m. EST I headed to the steakhouse near the hotel which is like team central on race weekend – and within walking distance of the hotel. This is what I love about NASCAR – the bar restaurant area was full of crew chiefs and engine builders and chassis guys and competition directors and we discussed everything from the Camping World Penalty to where will Tony Stewart go? Will you look at the time – I gotta get out into the garage. Posted by claireblang in Claire B's Mail. Posted by claireblang in NASCAR. Brienne Davis was smart and talented. She was one tough cookie who enjoyed life and the sport she represented. 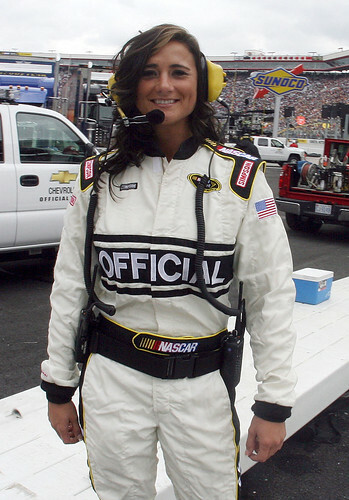 Her fellow officials, drivers, crew members and NASCAR officials remember her as being extremely focused on what she wanted to accomplish and a true friend to many in the NASCAR community who embraced her as a member of the family. The memorial service at Raymer Funeral Home in Huntersville, NC today is a testament to what she accomplished as an official and as a friend before she tragically lost her life in a car accident last week in Huntersville, NC. This past weekend at Phoenix, many in the garage struggled to make sense of the loss of Davis and to do their jobs while grieving for one of their own. CLICK HERE to view a scrap book compiled from interviews with those in the garage who shared their remembrances of Brienne with me so that I might share them with.